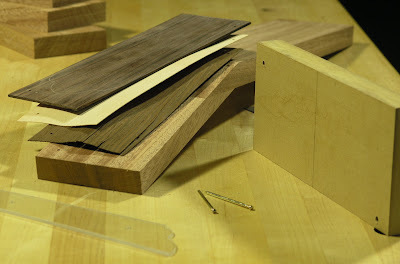 Yesterday, I prepared the neck for receiving the headstock veneer. I scraped the joint free from squeezed out glue and trued it. 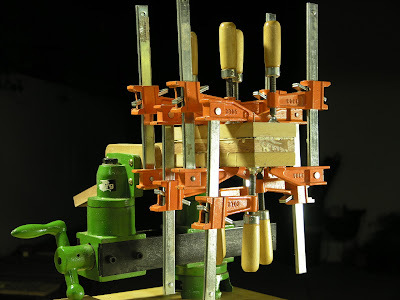 I must say that the Cumpiano clamping method for gluing the neck joint worked very well and as a result there was virtually no movement in it. The top face veneer is scrap from the bridge/fingerboard stock. The end of the lumber had a 4" long check on one side of the face that rendered it useless so I cut it off 7" down used the good side for the bridge and the bad was resawn into 1/8" sliced that was just wide enough to be bookmatched into a faceplate. The check was filled with epoxy mixed with sawdust from the resawing. After the two pieces were glued together to a faceplate, I scraped it down to 2mm thickness. 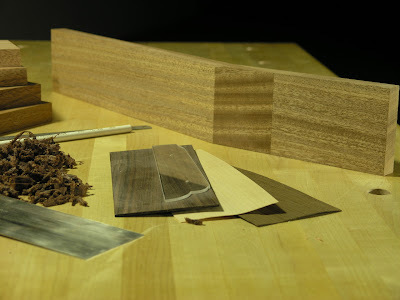 The other two veneer slices that make up the sandwich are maple and wenge that was cut from sheets I already had. I also made an acrylic template for the head and traced the outline onto the faceplate. The veneers were then carefully laid in place on the head in position and two holes outside the template was drilled through the veneer and into the headstock. These holes were to received two small brads in order to hold veneers in place and not slide around in the wet glue when clamping pressure was applied. I also cut a clamping caul from MDF with holes to house the brads protruding from the head and veneer assembly. I got a lot of squeezed out glue as usual. This time I made an attempt to wipe it off, but not very successfully. It smudged everywhere. What to do?